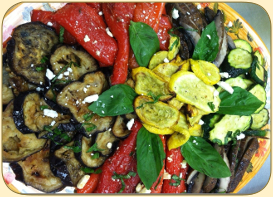 Our cold lunch display of gourmet deli and fresh homemade salads are sure to please your hungry employees and/or clients. Make a lasting impression at your business luncheon meetings with our buffet spreads! Always top quality; we won't settle for less. Enjoy! 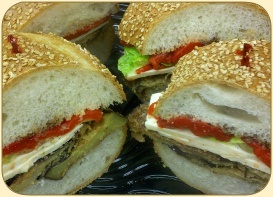 *We will give an assortment of these types of sandwiches. Salad Selections from "Great" and "Specialty" Salad Lists are listed after Deli Packages. 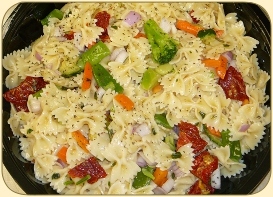 *35 guests and over - you may add one more "Great" salad choice to your menu at no additional charge. Looking for something a little extra special? Try these upscale "Box" lunches which include a variety of 4 different delicious gourmet sandwich selections in our white sturdy lunch box with handle. Assorted Cocktail Sandwich Platters - Your Selection of meats, cheeses or spreads on cocktail rye and mini party rolls. All our subs are made with quality cuts of meats and fresh vegetables served on delicious old country sesame seeded party bread. Triple-decker stacked sandwiches served with your choice of Pastrami, Corned Beef, Breast of Turkey, or Roast Beef piled high on Jewish Rye bread with Cole Slaw and Russian Dressing. We can customize your lunch choices and incorporate any of our other options listed above; therefore, please call for pricing on any of our party-type sandwich options.